The Opening Ceremony of Delhi’s Pandora's Box! The Opening Ceremony of Delhi’s Pandora’s Box! Fireworks? 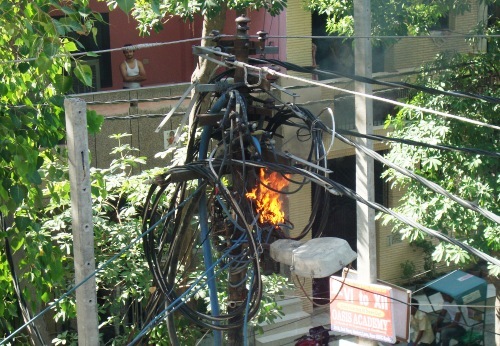 Nah, an overloaded electric pole could hold it no more, in North Delhi’s Vijay Nagar colony. World class city (if there’s such a thing) will take more than a CWG in its making! Earlier this year during the month of March, I met with the wife of a foreign dignitary who was recently posted in Delhi. It was her first visit to India and she expressed her interest to tour the country in the coming days and learn more about the culture and tradition of the people. I told her, when she asked me what was the best thing about India, that it is the diversity one finds here which makes India an exciting and interesting place. She narrated how her father who visited India decades ago had told her about the cows and other animals that roam freely on the roads. She said it was hard for her to believe it back then but she was excited to see it for herself now and could not agree more. This was the India she expected to see and what makes the country exciting to explore. Many tourists visiting the country undoubtedly find the madness and buzz created by different aspects of Indian culture attractive and worth exploring. The streets of Chandni Chowk and Nizamuddin have over centuries witnessed foreigners who come here to enjoy the charismatic ambiance of the places. The bustling market areas, people shouting for bargains, food smell overriding the footpaths, dogs barking in the back-lanes, people feeding cows on the roadside, monkeys hovering around temples for prasad (now their food), beggars at traffic lights, indiscipline men peeing in public places, women decked with jewelery, people spitting everywhere, and many more is some of the unexplainable behaviour that Indians are famous for and the very entity that opens an unforgettable experience for many foreign tourists. Well, India is shining but only in few sectors like Information Technology, and cricket maybe. But those alone don’t make the nation. Truth is, we have never really addressed the basic requirements of civilization. Civic sense issue have always been eluded more on the pretext of differences in cultures and traditions than anything else. It is treated like a problem of one community which is linked to their tradition or culture and which is forbidden to be tackled by any person of the same or another community/ region. Cows for long have enjoyed the freedom to roam around in the city by virtue of being linked to the Hindu religion. And not to forget monkeys that frequent temples and places of worship. Stray dogs which recently caught the media’s limelight for entering the coveted Games Village, are but an issue that citizens of Delhi have faced over the years and failed to address. Somehow, addressing and talking about civic sense problems is treated as a taboo and have been ignored for long. The Commonwealth Games 2010 has brought Delhi to the attention of world media with many other countries participating in these Games. The news of corruption tearing apart the nation’s pride and the complaints that has poured in over the inadequate facilities and unhygienic conditions of the Games Village, is nothing but unwanted publicity that the city is getting. The state of accommodation in the athletes village has been described by many as “filthy”. Not only do foreign visitors want a clean and properly maintained accommodation, but even the Delhi Government has been declaring time and again that it wants a clean and beautiful city prepared for the Games. Then, what really was the problem is an open mystery. And speaking about its clean up drive, the Delhi Government has tagged beggars in the capital streets as filthy and unrepresentable to the foreign eyes. The government has built high rise walls to hide the city slums and in its recent drive will hide the beggars in some selective parks which will be covered with tents and Games banners. Not only that, “the filth” were driven away to go back to their native villages but many failed to obey the order. The hypocrisy of addressing such issues became clearer with the government deciding to not only provide temporary shelters but also ensure that beggars stay put inside them from October 3 to October 14. The Government has also decided to provide them food and other necessities like stationed mobile toilets to ensure they don’t defecate in public. It is hard to decide who is the filth and what things are filthy at this point of time. And without doubt it is creating an ironic atmosphere in the city. Things that could be acceptable to the foreign delegates, things they may be coming here to see, may very well be the things the Government is trying to get rid off, in its “preparation” for the Games. Getting the dogs out of the Games Village and get proper hygienic accommodations is what one wants, while the other wants the beggars and migrant workers out of the city to give it a clean look. Since its the Commonwealth Games that the capital is hosting, one could not help but ponder upon the thought that we may still be living with a ‘colonized’ mindset. Didn’t the British teach us better manners and while introducing the babu system. Isn’t them from where we got the high class taste of things. What standards are we aspiring for and at what cost, needs to be addressed at all levels of national development including the sports and Games sector. And more importantly, we need to remind ourselves that charity begins at home and family is the basic unit of a society. So, let the change begin from each one of us and let it take over the society and the nation as a whole!